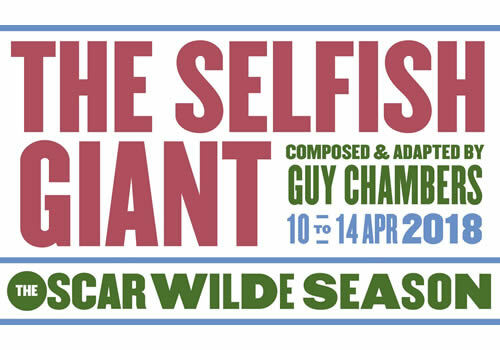 Multi-award winning composer Guy Chambers adapts Oscar Wilde’s short story The Selfish Giant for the stage, playing as part of the year-long season celebrating the playwright. Guaranteed to enthral theatregoers of all ages, the production is presented by Dominic Dromgoole’s Classic Spring Theatre Company and Royal and Derngate, Northampton. One of Wilde’s little-known stories, which also include The Happy Prince and Other Tales, The Selfish Giant is the heart-warming story of a Giant who adores his garden. Unfortunately, he won’t let any children play in it. But as winter comes and threatens not to leave, the Giant looks out at his garden and is forced to make a big decision. The Selfish Giant is portrayed by Jeff Nicholson (Sweeney Todd, Urinetown), with further cast members including Olly Dobson, Jacob Fisher, Izuka Hoyle, Rose Shalloo, Scott Sutcliffe and Laila Zaidi. Natasha Cottriall and Laura Sillett narrate. Directed by Bill Buckhurst, whose critically-acclaimed Pie and Mash shop-set production of Sondheim’s Sweeney Todd is now playing to packed-out audiences on Broadway, the production is set in a concert-style and features a large band of extraordinary musicians. Adapted and composed by Guy Chambers, a three-time BRIT and Ivor Novello award-winner, The Selfish Giant becomes a new folk opera. Unlike any of the other productions that feature in the season, which include A Woman of No Importance, An Ideal Husband and a reading of Wilde’s letter De Profundis, The Selfish Giant sees a magical world come to life on stage, transporting audiences on an enchanting journey. The production plays limited performances at London’s Vaudeville Theatre, from 10 to 14 April 2018. The Selfish Giant is recommended for those aged 8 and up.